You are interested in Italian Lakes weddings? We offer the perfect service and the most charming wedding venues for a wedding at one of the amazing and famous Italian Lakes. The four most popular ones are Lake Maggiore (Lago Maggiore), Lake Como (Lago di Como), and Lake Garda (Gardasee). Apart from those ones, there are also several minor lakes – such as Lake Orta, located in the west of Lake Maggiore, and Lake Iseo, located between Como and Garda. Those lakes offer numerous picturesque wedding venues from stylish private villas to old romantic castles and palaces or elegant luxury hotels- which are perfect locations for romantic wedding receptions in Italy. 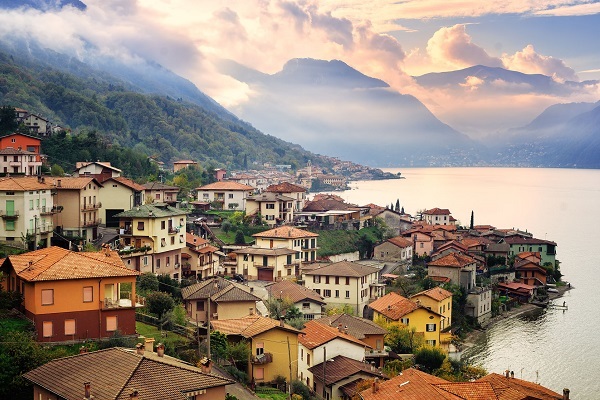 Beautiful settings like green gardens cascading into blue waters, romantic islands and charming small towns such as Bellagio, Verbania or Varenna build the perfect frame for your wedding. Further, our portfolio does not only offer the ideal location for your wedding reception in Italy. We will also be happy to support you with the planning of your symbolic, civil, catholic, protestant or Jewish wedding ceremony in the Italian Lake region. In addition, we can also support you with all the necessary documents, the choice of your wedding decoration and bridal bouquet and with the booking of the perfect photographer, band and hairdresser. Whatever you wish for your wedding – our wedding planners will design YOUR individual Italian Lakes wedding to perfection. Let your wedding stand out with an exclusive event in the most beautiful and elegant surroundings Italy can offer.